I’ve gotten lots of good feedback about today’s training. It was great fun and VERY educational. Be A Best Company	Find Out What REALLY Makes an Organization a Great Place to Work & What You Can Do to Consistently Be One. Creating an environment in which employees are satisfied and consistently do their best work remains elusive to many HR professionals and senior business leaders. Find out what really makes employees do their best work and remain engaged over long periods of time. 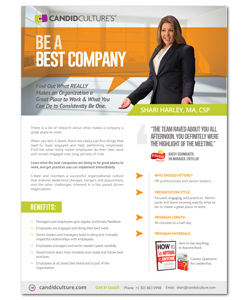 Learn what the best companies are doing to be great places to work, and get practices you can do in your own organization. Create and maintain a successful organizational culture that endures leadership changes, economic challenges, and mergers and acquisitions. Managers and employees give regular and timely feedback. Employees are engaged and doing their best work. Senior leaders and managers build trusting and mutually respectful relationships with employees. Employees, managers and senior leaders speak candidly. Departments learn from mistakes and create and follow best practices. 45-minutes to a half day. Focused, engaging, and practical. Participants will leave knowing exactly what to do to create a great place to work. HR professionals and senior leaders.